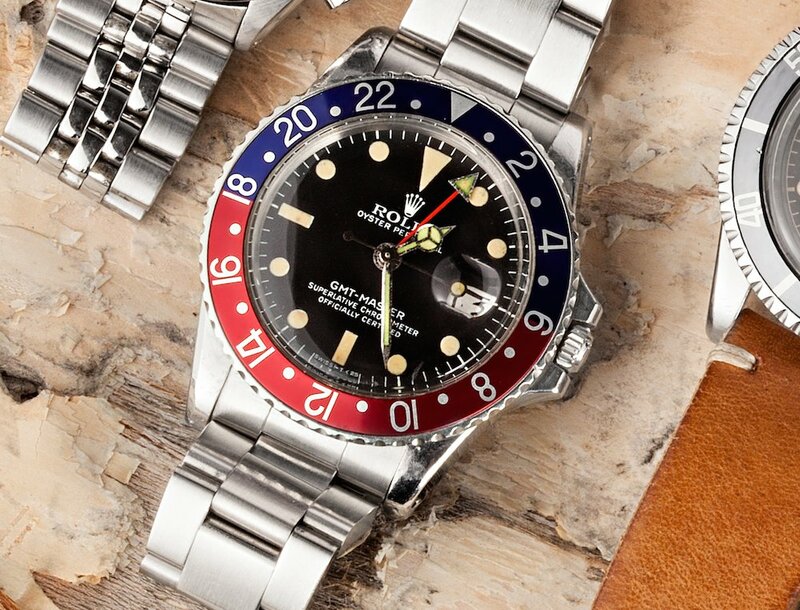 A part of the Rolex catalog for two decades, the GMT-Master ref. 1675 is one of the brand’s most iconic watches. Aside from its instantly recognizable looks, the GMT-Master stands out for its real-world practicality for travelers. In an age of smartphones, laptops, and tablets, perhaps you don’t see the need for a vintage GMT-Master watch to keep track the time while jetting across the skies, but I beg to differ. With a few turns of the winding crown and a couple clicks of the bezel, this is one stylish companion you want onboard. Join me as I fly with the vintage GMT-Master 1675 Pepsi in tow. Learning how to use a GMT is a simple and easy task. 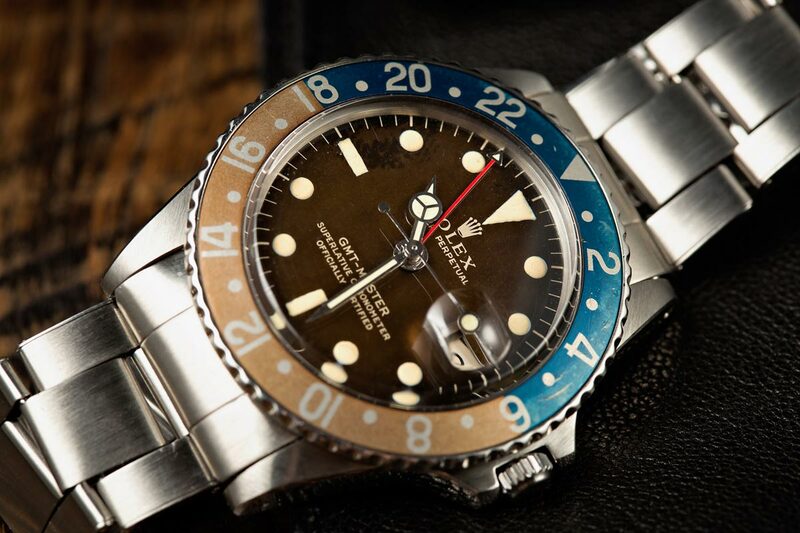 Since it was manufactured from 1959 until 1980, Rolex modified the GMT-Master ref. 1675 a lot during its production run. This particular example of the GMT-Master 1675 is an early model as illustrated by its pointed crown guards, small triangle on the tip of the GMT-hand, and glossy gilt dial. On top of the 40mm stainless steel case sits a bi-colored blue and red “Pepsi” bezel. The combination of two colors wasn’t just an aesthetic decision, but in fact, helps users quickly differentiate between nighttime hours (blue) and daytime hours (red) reading the bezel. 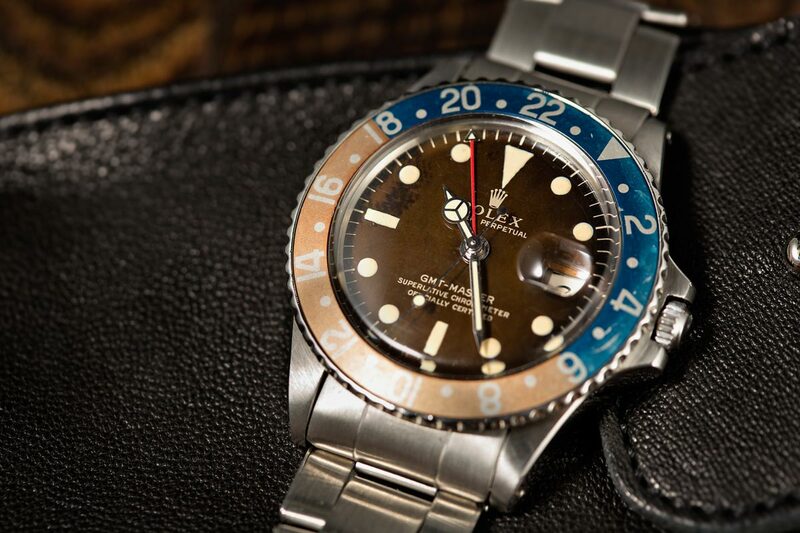 Vintage Rolex GMT-Master ref. 1675 has a rotatable bezel that can be used to your advantage. Since Bob’s Watches is based in sunny Southern California, my go-to international airport is LAX. So before heading to the airport, I grab my trusty GMT-Master ref. 1675 from my watch box, wind it up a bit to get it going, and get ready to set my current local time and date. Since this is a GMT-Master and not a GMT-Master II, the extra 24-hour hand turns along with the main hour hand. Plus, the GMT-Master 1675 has a non-quickset movement, so the date needs to be adjusted by turning the hands. First off, I make sure that the inverted triangle on the bezel is positioned at the top of the watch. It’s currently 10 am here in LA, so after I get the correct date in the window by turning the hands accordingly, I set my center hands to show 10 o’clock, also ensuring that the GMT-hand is pointing to “10” on the red portion of the bezel (and not 22 on the blue portion of the bezel). Once I’m on the plane a few hours later, it’s now 1pm—so the GMT-hand is now pointing to “13” on the bezel. Flight is on time and we take off for London. A vintage GMT Master 1675 is a great watch as a traveling companion. About 10 and half hours later, the plane lands in London so I need to change my watch to local time. My watch is currently showing 11:30 pm in LA but it’s 7:30 am the next day in London. So, I move my center hands forward (and observe that the date changes to the next day once I pass midnight) to display 7:30 am and the GMT-hand is now pointing to just after “7” on the bezel. I now turn the bezel so that the GMT-hand points to just after “23” on the bezel and just like that I can see that local time is 7:30 am and my home time is 11:30 pm. Not bad for a watch made over five decades ago! Next time you travel to a different time zone, consider wearing a Rolex GMT-Master and note how well this vintage beauty performs in today’s high-tech world.